On 31 December 1972, French goalkeeper Grégory Coupet was born. He went on to help Lyon to a record seven straight Ligue 1 titles from 2002 to 2008. Born in the commune of Le Puy-en-Velay in south-central France, Coupet joined the youth program of his local club, Olympique Le Puy, but signed his first professional contract with Saint-Étienne in 1993. He made only one appearance for the club that first season, but established himself as a regular starter the following year. Despite his promising performances, Les Verts were relegated at the end of the 1995-96 season, prompting his move to rivals Lyon in December 1996. At Lyon, Coupet anchored a defense that saw steady improvement in the club's final league position every year, culminating in their league title at the end of the 2001-02 season--the first in an unprecedented seven consecutive Ligue 1 titles. Along the way, they also won the Coupe de France (2008), Coupe de la Ligue (2001), and the Trophée des Champions (six times, from 2002 to 2007). By the time Coupet left Lyon for Atlético Madrid in the summer of 2008, he had made 518 appearances, ranking him second on the club's all-time list behind Serge Chiesa (541 appearances from 1969 to 1983). Despite his club success, including Ligue 1 Keeper of the Year awards in 2004 and 2005, Coupet never enjoyed a long run as France's first-choice keeper, falling behind Fabien Barthez earlier in his career, then behind Hugo Lloris and Steve Mandanda later. Nevertheless, he earned a total of 34 caps, including a starting run during Euro 2008. He retired in 2011 after finishing his career at Paris Saint-Germain. 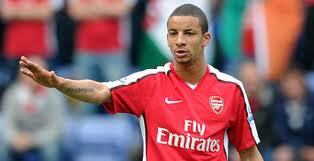 On 30 December 2009, Arsenal won at Portsmouth, 1-4, in a match where neither side's starting XI included an Englishman. It was the first time that had happened in the English top flight. While not necessarily uncommon for Arsenal at the time, it was an unusual development for Pompey, who were forced by injury to start Bosnian keeper Asmir Begović in place of their regular keeper, England's David James. The most-represented nation on the pitch that day was France, with a total of 7 (5 for Arsenal and 2 for Portsmouth). An additional two players--Portsmouth's Hassan Yebda and Nadir Belhadj--were born in France, though both play internationally for Algeria. The remaining players were from Bosnia, Iceland, the Republic of Ireland, Israel, South Africa, Scotland, Ghana, Spain, Belgium, Wales, Cameroon, Russia, and Croatia. The Gunners went up 3-0 with goals from Eduardo (28'), Samir Nasri (42'), Aaron Ramsey (69'), before Belhadj puled one back for Portsmouth in the 74th minute. After Alex Song restored the visitors' margin in the 81st minute, an Englishman finally stepped onto the pitch, with midfielder Craig Eastmond (pictured) replacing Nasri in the 85th minute. Not to be outdone, Pompey added an Englishman of their own, with midfielder Michael Brown replacing Scotsman Richard Hughes. 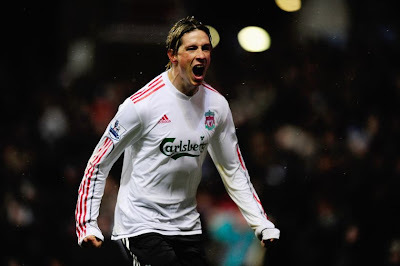 On 29 December 2009, Spanish striker Fernando Torres scored his 50th league goal for Liverpool, reaching that milestone faster than any other player in the club's history. Nicknamed "El Niño," Torres arrived in Liverpool from Atlético Madrid in July 2007 when he was only 23. He made his league debut for the Reds on 11 August 2007, then scored his first league goal one week later in a 1-1 draw with Chelsea. He provided a total of 33 goals in all competitions that first year, helping Liverpool to a 4th-place league finish and the Champions League semifinals. His 24 league goals tied him for second in the Premier League. Injuries hampered his second season on Merseyside, limiting him a still-respectable haul of 14 league goals as Liverpool secured a second-place finish. The record 50th goal came the following season, his third with Liverpool. Deep into stoppage time at Aston Villa with the match scoreless, Torres latched on to a 93rd-minute rebound and slotted it past Villa keeper Brad Friedel for the win. It was Torres' 72nd league match for Liverpool, eight matches fewer than the club's former record-holder Sam Raybould and 12 matches fewer than Liverpool's all-time leading goalscorer, Ian Rush. 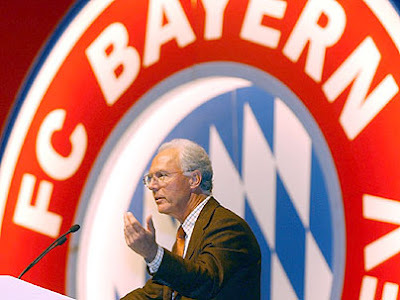 On 28 December 1993, Bayern Munich legend Franz Beckenbauer returned to his former club, this time as manager. Beckenbauer, nicknamed "Der Kaiser," originally joined Bayern's youth team in 1959 and remained with the club until 1977. During that time, they won 4 league titles, 4 DFB-Pokal Cups, and 3 consecutive European Cups (1974, 1975, 1976). He also helped guide Germany to victory in the 1972 European Championship and the 1974 World Cup. 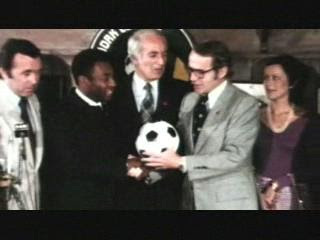 His play earned him the Ballon d'Or in 1972 and again in 1976. After spells with the New York Cosmos and Hamburg, he moved into management, with successful tenures in charge of West Germany and Olympique Marseille before his return to Bayern in 1993. The return brought more silverware in the form of the 1994 league title. After only one season, he became president of the club, though he briefly returned as manager in 1996, winning the UEFA Cup. On 27 December 1915, the FA issued lifetime bans against seven Manchester United and Liverpool players for participating in a match-fixing scheme the previous season. The match in question was played on 2 April 1915, near the end of the season. United were in 18th place, only one point clear of relegation, while Liverpool were sitting comfortably in 13th, not in danger of relegation, but out of contention for any silverware. United won 2-0, thanks in part to a missed Liverpool penalty. Rumors swirled immediately about a fix, prompting the FA to investigate. They determined that seven players--Sandy Turnbull (pictured), Arthur Whalley, and Enoch West from United; Jackie Sheldon, Tom Miller, Bob Pursell, and Tom Fairfoul from Liverpool--had colluded to determine the outcome. The motivation appeared to be personal financial gain, with all seven players placing bets on United to win. But the two points helped United's survival, as they finished 1 point above the relegation zone. West vehemently denied any involvement, even suing the FA--unsuccessfully-for libel. All seven participants received lifetime bans, though all but West's were eventually lifted in 1919 in recognition of their service during World War I. In Turnbull's case, the reprieve was posthumous, as he died in action. On 26 December 1979, Sheffield Wednesday delivered a 4-0 beatdown on rivals Sheffield United in a match that would come to be known as the Boxing Day Massacre. The rivalry, known as the Steel City Derby, dates back to 1890 and is one of the most competitive derbies in England. At present, out of 125 competitive matches, United have a slight edge with 45 wins to Wednesday's 41. 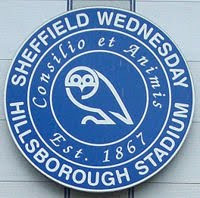 A Third Division record 49,309 people packed the terraces at Hillsborough as the Owls, then in 5th place, hosted first-place United. The home supporters did not need to wait long before celebrating, as left winger Terry Curran, then in his first season with Wednesday, fired the ball into the net from 25 yards out. The Blades had several chances to equalize before the break, but Wednesday keeper Bob Bolder steadfastly denied them. United's day took a turn for the worse when their captain Mick Speight left in the 54th minute after a goalmouth collision left him with injured ribs. Wednesday right winger Terry Curran, also in his first season at Hillsborough, made the best of the advantage by doubling the advantage with a well-placed header. He then provided an assist for the Owls' third goal, scored by Jeff King, then drew the 87th-minute penalty that was converted by Mark Smith to cap the rout. The match proved to be a turning point for both clubs, as Wednesday proceeded to climb the table and gain promotion to Division Two for the 1980-81 season. United, meanwhile, finished in 12th place and were relegated the following season. 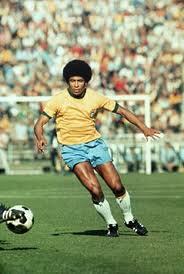 On 25 December 1944, Brazil star Jairzinho was born in Rio de Janeiro. He helped lead them to World Cup victory in 1970, becoming only the third person in history to score in every one of his team's matches in the tournament. He spent the majority of his career with his hometown club, Botafogo, first joining their youth team, then playing in the first team from 1959 to 1974. There, paired with his idol Garrincha, he won the 1964 Rio State Championship. After Garrincha left in 1965, Jairzinho took his place, moving from the left wing to his preferred position on the right, where he excelled, winning numerous trophies with Botafogo. Jairzinho joined the national team in 1964. After a disappointing first-round exit in the 1966 World Cup, he got off to a roaring start in 1970, scoring twice in Brazil's 4-1 opening win against Czechoslovakia. He proceeded to score in every match as Brazil won the tournament, joining Uruguay's Alcides Ghiggia (1950) and France's Just Fontaine (1958) as the only players to score in every match for their country in a World Cup. He left Botafogo in 1974 for a short stay with Marseille, starting a journey that included stints at a number of clubs, including a second term at Botafogo from 1981-82. He retired in 1983 after a brief period with 9 de Octubre in Ecuador. 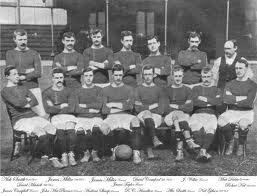 On 24 December 1898, Rangers recorded their record victory, beating Hibernian 10-0 at Ibrox. It is also Hibernian's worst-ever defeat. The victory was no surprise--it was Rangers' 15th match of the season and they had won their previous 14--but the margin was unexpected. Hibs were just behind Rangers in second place and had only narrowly lost to them by the score of 3-4 in their meeting the previous month. The signs were there, however, as Rangers' last three matches included two routs of similar proportion, an 8-0 victory over Clyde in week 12 and a 7-0 win over Dundee in week 14. After beating Hibs, Rangers went on to win their last three matches over St. Mirren (3-2), Celtic (4-1), and Clyde (3-0) to complete a perfect league season and win their second of their record 53 league titles. Labels: Hibernian F.C., Rangers F.C. On 23 December 2006, Manchester United scored their 2000th goal under Sir Alex Ferguson, delivered by Cristiano Ronaldo in a 0-3 trouncing of Aston Villa. United started the day at the top of the table, 2 points clear of second-place Chelsea, whose manager, José Mourinho, had predicted that United would not top the table at Christmas. Despite the pressure to get all three points, Ferguson rested star striker Wayne Rooney in favor of Louis Saha, playing alongside wingers Ronaldo and Ji Sung Park in a 4-3-3 formation. 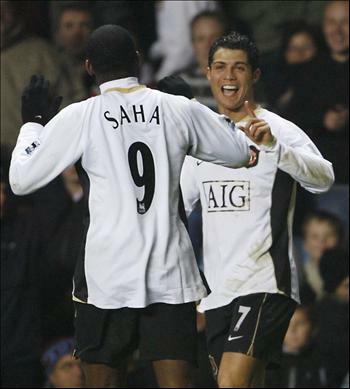 That decision looked questionable in the first half, as Saha failed to ignite United's anemic attack. But as Ferguson prepared to bring Rooney on in the second half, Ronaldo completed a dashing 50-yard run then unleashed a fierce shot in the 58th minute. Villa defender Gary Cahill managed to block it, but failed to control the ball which landed at Ronaldo's feet for an easy goal--United's 2,000th under Ferguson. Paul Scholes added a second in the 64th minute before Ronaldo completed the rout with another in the 85th minute. The win secured United's position at the top of the table for Christmas; indeed, they remained in first for the remainder of the season to capture their 16th league title. On 22 December 1912, Hugo Meisl made his debut as manager of Austria with a 1-3 victory over Italy in Genoa. The win presaged a successful reign, as Meisl built Austria into one of the world's greatest teams. Born in Bohemia in 1881, Meisl began his football career as an administrator with the Austrian Football Association, where he rose to the position of General Secretary before becoming manager of the national team. His first spell in charge lasted only two years, as he left to serve five years in World War I. But he resumed the position in 1919 after the war's end. Austria's greatest period came during the early 1930s, when they enjoyed a 14-match unbeaten run. Christened the "Wunderteam," that Austrian side dominated European competition, led by their talismanic center forward Matthias Sindelar. They entered the 1934 World Cup as favorites, but lost to eventual winners Italy in the semifinals, 1-0. 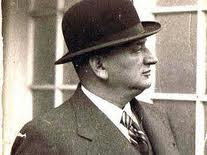 Meisl remained with Austria until his death from a heart attack in 1937. In that time, he amassed a record of 71 wins, 30 draws, and 32 losses. 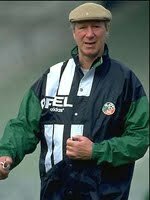 On 21 December 1995, Jack Charlton resigned as manager of the Republic of Ireland. At the time, he had the highest winning percentage of any non-caretaker manager for the national team. Charlton had been an outstanding center back for England and Leeds United, the club where he spent his entire career. He retired from playing in 1973, having won a League title, an FA Cup, a League Cup, and two Inter-Cities Fairs Cups with Leeds, and the World Cup with England. He moved directly into management, taking over at then-Second Division Middlesbrough in 1973. He guided them to promotion in his first season, earning himself the 1974 English Manager of the Year award in the process. He left Middlesbrough in 1977 and, after spells at Sheffield Wednesday (1977-83) and Newcastle (1984-85), he took charge of the Republic of Ireland. As the national team's first English manager, his appointment was controversial, but he quickly converted his critics by qualifying for the 1988 European Championships, then taking the team to their first-ever World Cup in 1990. There, they advanced to the quarterfinals before narrowly losing to Italy, 1-0. Ireland again qualified for the World Cup in 1994, where they beat Italy in the first round before getting knocked out by the Netherlands in the second round. Ireland met Holland again in a playoff for Euro '96, with the Dutch winning again to eliminate the Irish from contention. Charlton resigned soon after, with a record of 47 wins, 30 draws, and only 17 losses. At the time, it was the best winning percentage for any Ireland manager at an even 50%. Since then, only Brian Kerr (2003-05) has done better at 53.13%. On 20 December 1992, New York Cosmos co-founder Steve Ross died in Los Angeles at the age of 65. Ross (pictured, center), who started his entrepreneurial career with a rental car business in the late 1950s, purchased the Warner Brothers-Seven Arts film studio in 1969 for $400 million. Ross served as CEO, president, and chairman of his new acquisition, soon expanded and renamed as Warner Communications. Ross, along with brothers Ahmet and Neshui Ertegün from Atlantic Records, founded the Cosmos in 1971. With a collection of local talent, the Cosmos won the NASL title in their second season, but could not sustain their success, failing even to qualify for the playoffs in 1974. Their declining form prompted Ross to make a bid for Brazilian superstar Pelé, who came out of semi-retirement and joined the Cosmos in 1975. Ross also used Warner Communications' deep pockets to bring additional high-profile players to New York, including Franz Beckenbauer, Carlos Alberto, and Giorgio Chinaglia. Under Ross' stewardship, the Cosmos became a club célèbre, becoming a prominent fixture in the New York social scene. They were also successful, winning four more NASL titles. But the extravagant spending eventually caught up with them and Warner sold the club in the early '80s to a consortium led by Chinaglia, ending Ross' association with the club. Ross's death in 1992 was caused by complications with prostate cancer. On 19 December 2009, Barcelona won a record 6th trophy for the calendar year, using an extra-time goal to beat Estudiantes in the Club World Cup. That year, Barcelona had already won La Liga, the Copa del Rey, the Supercopa de España, the UEFA Supercup, and the UEFA Champions League, matching Liverpool's haul of 5 trophies in 2001. The Champions League victory qualified them for the Club World Cup, which included the champions of 5 other confederations and the UAE's Al-Ahli, who qualified as hosts. Both Barcelona and Estudiantes entered the competition at the quarterfinal stage, with the Catalan side beating Mexico's Atlante and the Argentinians defeating South Korean team Pohang Steelers to set up their meeting in the Final. Although Barcelona were heavily favored, a driving header from center forward Mauro Boselli put Estudiantes ahead in the 37th-minute. Despite constant pressure from Barcelona, the underdogs held on and looked to have secured victory when, with one minute left, Barça pulled level with a header of their own from forward Pedro. Lionel Messi, that year's Ballon d'Or winner, provided the deciding goal in extra time, receiving a long cross and slipping the ball under Estudiantes keeper Damien Albil in the 110th minute. Two days later, Messi was named the FIFA World Player of the Year. 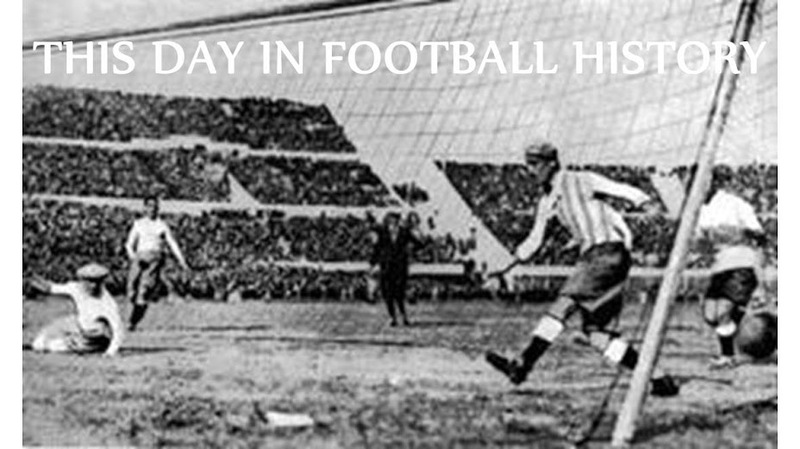 On 18 December 1921, Poland played their first official international, a 1-0 loss to Hungary. It was a humble start for a team that would later claim an Olympic gold medal and twice finish in third place at the World Cup. The Polish national team was only 2 years old when they lost to Hungary, having been founded in December 1919. And it would take another 5 months before they recorded their first victory, beating Sweden 2-1 in Stockholm. 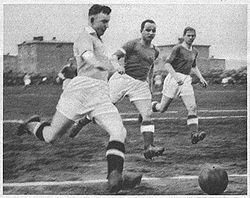 By the 1930s, however, they had improved rapidly, led by prolific goalscorer Ernst Wilimowski (pictured, with the ball). Even without Wilimowski, who was suspended for a year for excessive partying, Poland nearly medalled at the 1936 Summer Olympics, finishing fourth after wins over Hungary and Great Britain. Poland's greatest achievement came at the 1972 Summer Olympics, when they won the gold medal with a 2-1 victory over Hungary. They followed that performance with a third-place finishes at the 1974 and 1982 World Cups. On 17 December 2006, Chelsea's Frank Lampard netted an 80th-minute equalizer against Everton to become the club's best midfield goalscorer. Chelsea went on to win the match 2-3. The previous record of 76 goals had been set by former captain Dennis Wise, who played at Stamford Bridge from 1990 to 2001. Lampard joined the club in June 2001 from West Ham, with Wise moving on to Leicester just over one week later. In his first season with the Blues, Lampard scored only 7 goals in all competitions, but by his third seasons, he had found his shooting form, providing 15 goals. He has remained in double-digits ever since, with a career-high 27 goals in Chelsea's Double-winning 2009-10 season. In the 2006 match against Everton, the Toffees were leading 2-1 late in the match when Lampard unleashed a right-footed rocket into the top corner of the net. It was his 77th goal for Chelsea and one of his most impressive. Didier Drogba then delivered the killing blow, taking the ball off the foot of an Everton defender to score in the 86th minute. Lampard left Chelsea in 2014 with a final tally of 171 goals for the club. On 16 December 1989, Barnsley substitute Ian Banks received a red card without even stepping onto the pitch. Barnsley, then sitting in 20th place in Division Two, were away at 16th-place Bournemouth. The hosts had just scored their second goal from an apparently questionable offside position, when the Barnsley manager called on Banks. As the midfielder warmed up on the touchline waiting to be waved on, he berated the nearby linesman for not raising his flag on the Bournemouth goal. Reports do not record his exact words, but they were strong enough to earn him a straight red card. It was the quickest ejection for a substitute in Football League history. 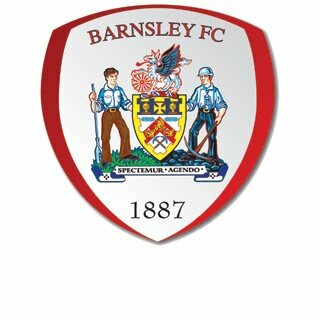 Down a man, Barnsley proceeded to lose 2-1. They survived the season, however, finishing in 19th place, while Bournemouth finished in 22nd and were relegated to the Third Division. On 15 December 1995, Samsung founded a new football club in the South Korean city of Suwon. 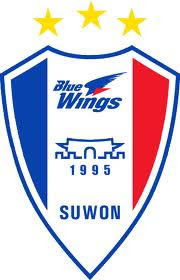 Known as the Bluewings, they have become one of the most celebrated clubs in Asia. Playing under former South Korean national team manager Kim Ho, the Bluewings joined South Korea's top flight, the K-League, in 1996 and nearly won it. After topping the table for the season's Second Stage, they narrowly lost the play-off against First Stage winners Ulsan Hyundai by the aggregate score of 3-2. After a slight dip in form in 1997, they won their first league title in 1998, then won another in 1999, part of a quadruple that included that season's Super Cup, League Cup, and the Adidas Cup. International success soon followed, as the Bluewings won back-to-back AFC Champions League titles in 2001 and 2002 (the latter in a dramatic penalty shootout against fellow K-League side Anyang LG Cheetahs). Former Bundesliga star Cha Bum-Kun replaced Kim Ho in 2004 and continued the club's winning streak by capturing the league title in his first season. More silverware followed, including two Korean FA Cups and another league title, before his retirement in 2010. 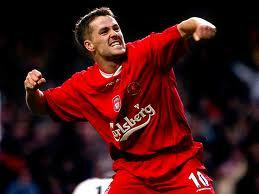 On 14 December 1979, future Liverpool star and Ballon d'Or winner Michael Owen was born in the English city of Chester. Owen signed a youth contract with Liverpool in 1991, then jumped to the first team in 1996. A prolific striker, he netted 18 league goals in his first full season, earning honors as joint top scorer and and being named the PFA Young Player of the Year. After winning additional golden boots in 1998 and 1999, he was instrumental in Liverpool's successful League Cup, FA Cup, and UEFA Cup runs in 2000-01, leading to him being named the 2001 European Footballer of the Year. The success drew the attention of Real Madrid, who signed him in August 2004 for a transfer fee of £8 million. But despite an impressive scoring record, he never settled in Spain and moved to Newcastle in August 2005 for a fee of £16 million. His four seasons with Newcastle were hampered by injuries so that, in his second season there, he made only three appearances. In all, he scored 30 goals in 79 appearances for Newcastle, but the club was relegated in 2009. Owen then spent time with Manchester United and Stoke City before retiring in 2013. Labels: Liverpool F.C., Manchester United F.C., Michael Owen, Newcastle United F.C., Real Madrid C.F. 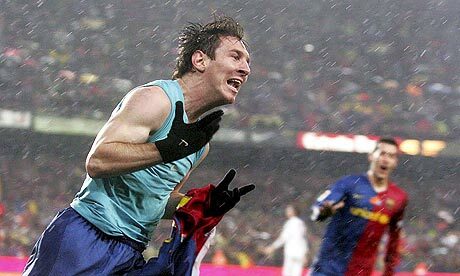 On 13 December 2008, Barcelona won their first Clásico in almost three years, beating Real Madrid 2-0. Since suffering a 3-0 loss to Barcelona on 19 November 2005, the Merengues rattled off a five-match unbeaten streak that included three wins and two draws, all in the league. Guardiola duly took over the following month and immediately began to reshape the team by offloading a number of players, including two-time FIFA World Player of the Year Ronaldinho. After an opening day loss to Numancia, Guardiola's Barcelona went unbeaten in their next thirteen league matches, with eleven wins and two draws. They were at the top of the table on 13 December when they hosted Real Madrid for Guardiola's first Clásico as manager. It was close until the last few minutes, when goals from Samuel Eto'o (83') and Lionel Messi (90') delivered a 2-0 victory. Barcelona extended their unbeaten streak against Madrid to seven league matches, with six wins and one draw, before finally losing in April 2012. During that run, they also went undefeated against their rivals in the Champions League and the Supercopa de España, getting a win and a draw in each of those competitions. 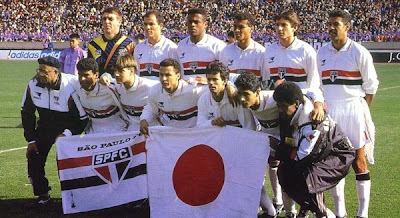 On 12 December 1993, São Paulo won their second consecutive Intercontinental Cup, beating European Cup runners-up AC Milan at the National Stadium in Tokyo. First contested in 1960, the Intercontinental Cup generally pitched the reigning Copa Liberatadores champion against the current European Cup holder. But Marseille, who had won the 1993 European Cup, were banned from international competition for a bribery scandal, so runner-up AC Milan took their place. São Paulo, who had won the previous Cup over Barcelona, took the lead with a 19th-minute goal from striker Palhinha, who had been the Capeonato Paulista's top scorer the previous season. Milan equalized after the break with a 48th-minute goal from forward Daniele Massaro, but the Brazilian side quickly regained the lead 11 minutes later with a goal from midfielder Toninho Cerezo. Milan striker Jean-Pierre Papin scored a late equalizer in the 81st minute, but as extra time loomed, São Paulo forward Müller scored the match winner with only 2 minutes remaining. After the 2004 Final, the Intercontinental Cup was replaced with the Club World Cup, which São Paulo won in 2005 and Milan won in 2007. 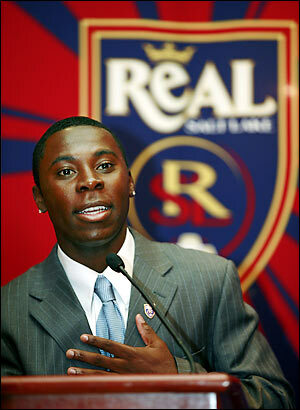 On 11 December 2006, DC United parted ways with midfielder Freddy Adu, sending him to Real Salt Lake along with goalkeeper Nick Rimando. Adu made history when he signed for United in 2004. He was only 14 at the time, making him the youngest American athlete in over a century to sign a contract with a professional team in any sport. He played in 31 matches in his first season, primarily as a substitute, and scored 5 goals as United won both the MLS Cup and the Supporters' Shield. He eventually earning a regular starting position by 2006, the same year in which he earned his first cap for the US national team. But he publicly complained about his lack of playing time, which undoubtedly played a role in his eventual transfer to Salt Lake. In return for Adu and Rimando, United received goalkeeper Jay Nolly, a major player allocation (valued between $250,000 and $350,000), and a portion of Adu's future transfer revenue. After just over 7 months in Salt Lake, Adu moved to Portugal to play for Benfica, who purchased his rights for $2 million. He later moved to a variety of clubs in Greece, Turkey, Brazil, Serbia, and Finland before returning to the US in 2015 to play for the Tampa Bay Rowdies. Rimando remains with Salt Lake where he won the 2009 MLS Cup was also named an MLS All-Star five times (2010, 2011, 2013, 2014, 2015). On 10 December 1997, MFK Košice lost 0-1 to Feyenoord, thus becoming the first-ever team to bow out of the Champions League with zero points. 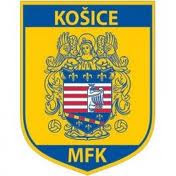 Reigning champions of Slovakia's top flight, Košice reached the group stage by beating Icelandic club ÍA 4-0 on aggregate in the first qualifying round, then defeating Spartak Moscow 2-1 on aggregate in the second qualifying round. In doing so, they were the first Slovakian club to make it to the group stage. But their good fortune ended there. They failed to even score in the first legs opening the tournament with a 3-goal loss to Manchester United, followed by a 2-0 loss to Feyenoord, then a 1-goal loss to eventual finalists Juventus. They improved in the rematch with Juve, but still fell, 3-2, then lost again to man United, 3-0. They were already guaranteed to finish at the bottom of the group regardless of the results in their last match against Feyenoord, who were also mathematically eliminated from the competition. Played at the Všešportový areál in Košice, the hosts kept it close for most of the match and nearly walked away with a point, but succumbed to an 81st-minute strike from Giovanni van Bronckhorst to end the tournament's worst campaign in history with 6 losses in 6 matches. On 9 December 2001, Gil Vicente FC defeated Alverca 3-2, but the result was subsequently annulled. Named after Portugal's most famous writer (1465-1537), Gil Vicente FC were founded in 1924 in Barcelos. They were promoted to the Portuguese top flight for the first time in 1990, but were relegated in 1997. In 1999, they returned to the top flight and ended the season in fifth place--their best-ever finish. In the 2001-02 season, they were challenging for a top-half spot, sitting in 10th when they hosted Alverca in December. Alverca, for their part, were 17th, only one spot above the bottom. The match went according to form, with the hosts winning 3-2, but the Portuguese Football Federation later learned that Gil Vicente's captain, Lemos, had received two yellow cards in the match, but had not been sent off as required by the rules. The Federation annulled the match, dropping Gil Vicente from 10th to 14th, and scheduled a replay for April. The replay ended as a 2-2 draw, which Gil Vicente followed with a 4-1 away victory over Alverca 11 days later. Alverca ended the season in last place and were relegated, while Gil Vicente finished in 12th. They struggled along for four more seasons, then were themselves relegated in 2006. On 8 December 2004, Mia Hamm and Julie Foudy ended their national team careers with a 5-0 victory over Mexico. Played before a crowd of 15,549 in Carson, California, the match was the last of a 10-game "Fan Celebration Tour" scheduled in honor of the team's victory in the 2004 Women's World Cup. It was the 271st appearance for Foudy, who had captained the team since 1991 (she was a co-captain from 1991 to 2000), and the 275th appearance for Hamm, a number exceeded only by Christie Rampone (311) and Kristine Lilly (352). Hamm, however, retired as the national team's all-time leading goalscorer with a total of 158. Though Hamm did not add to her tally against Mexico, she provided assists for the first two goals, scored by Aly Wagner and Abby Wambach. They each completed a brace as the hosts went up 4-0 by the break before winning 5-0. Their retirement, along with that of teammate Joy Fawcett, who was unable to play due to injury, ended a dominant period for US football in which the women's national team won two World Cups and two Olympic gold medals. 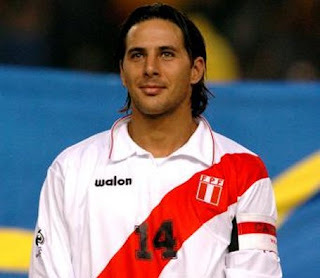 On 7 December 2007, Chelsea striker Claudio Pizarro was suspended indefinitely from the Peruvian national team for breaking team rules during their World Cup qualification campaign. According to a Peruvian journalist, Pizarro and several other players, including Jefferson Farfan, Santiago Acasiete, and Andrés Mendoza, smuggled women and alcohol into the team hotel after Peru's 1-1 draw with Brazil on 18 November and only three days before their 5-1 hammering by Ecuador. Despite Pizarro's claim of innocence, the Peruvian football federation suspended him for 18 months and fined him $80,000. Although they later reduced the suspension to 3 months and the fine to $10,000, Pizarro appealed to the Court of Arbitration for Sport to clear his name. The CAS overturned both rulings, finding that "[t]he facts put forward by (the federation) in relation to Pizarro were not supported by concrete evidence." Peru, however, has not recalled Pizarro to the national team since his initial suspension. Peru, who had taken only 2 points from 4 qualification matches before the suspensions, finished at the bottom of the CONMEBOL standings and did not qualify for the 2010 World Cup. Pizarro returned to the national team in 2011. On 6 December 1930, Thames AFC set a Football League record when only 469 people showed up for their Third Division South match against visiting Luton Town. Thames had been founded only two years earlier by a group of businessmen who had built a new ground--West Ham Stadium (pictured)--and needed a team to fill it. The stadium had a capacity of 120,000, but Thames competed for supporters with several nearby clubs who were older and thus more established, including West Ham United, Millwall, Charlton, and Orient. Despite poor support, Thames fared well, finishing in third place in the Southern League Eastern Division in 1930 to earn election to the Third Division South. There, however, they struggled, winning only three matches and drawing two out of their first 16 to sit dead last in the table when Luton came to town. Although only 469 people attended, they witnessed a rare sight as Thames eked out a 1-0 victory. Luton's share of the ticket sales was a meager 1s, 7d. It was paid by postal order, which Luton framed and displayed in their boardroom. Thames narrowly avoided relegation that year, but succumbed the following year and promptly dissolved. 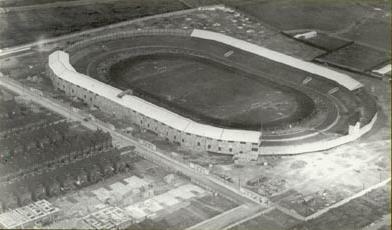 West Ham Stadium continued in use for racing and occasional baseball until it closed in 1972. On 5 December 1998, DC United overcame a first-leg deficit to win the final Copa Interamericana. Since 1968, the Copa Interamericana had matched the winners of South America's Copa Libertadores against the CONCACAF Champions Cup holder, though the tournament was not played every year. 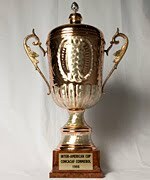 The 1998 edition featured a match-up unique in the Cup's history, pairing the tournament's first Brazilian team--Vasco da Gama--against its first US side--DC United. Vasco won the first leg, played at DC's RFK Stadium in November, with a solitary goal from midfielder Felipe. Although Vasco were the ostensible hosts for the second leg, it was played at Lockhart Stadium in Fort Lauderdale, Florida. Vasco arrived having just lost 2-1 to Real Madrid in the Intercontinental Cup four days earlier. The match was scrappy, with the referee issuing yellow cards to players from both sides within the first 15 minutes. DC drew level on aggregate with a 34th-minute strike from midfielder Tony Sanneh. Vasco manager Antônio Lopes made some drastic changes at halftime, withdrawing midfielder Juninho and forward Luizão for substitutes Guilherme and Vitor, but it was DC who moved ahead with a goal from defender Eddie Pope in the 77th minute. That was the last Copa Interamericana, as CONCACAF teams started competing in CONMEBOL competitions, making the tournament redundant. On 4 December 2009, Adidas introduced their controversial new match ball for the 2010 World Cup, the Jabulani. Named after the Zulu word for "celebrate," the ball was made from eight spherically molded panels and had a textured surface designed to improve its aerodynamics. The result was unpredictable flight behavior which drew heavy criticism from several players. Goalkeepers were particularly unhappy, including Brazil's Julio Cesar, who called it a "supermarket ball," Spain's Iker Casillas, who said it was "horrible," and Italy's Gianluigi Buffon, who said it was "absolutely inadequate." 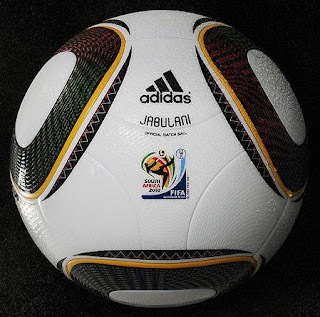 Predictably, players contracted to Adidas provided more favorable reviews, including such high-profile stars as Kaká ("just great"), Michael Ballack ("fantastic"), and Frank Lampard ("very strong"). The overall effect appeared to be a reduction in goalscoring, as the tournament had only 145 goals, the fewest of any World Cup since the tournament expanded to 64 teams in 1998. On 3 December 1982, former Ligue 1 Player of the Year and BBC African Footballer of the Year Michael Essien was born in Accra, Ghana. An energetic box-to-box midfielder and tenacious defender, Essien began his professional career in 2000 with French club Bastia. Initially used as a reserve back, he switched to midfield in 2001 and flourished. After only three seasons, he drew attention from bigger clubs and signed with Lyon in 2003. In two seasons at Lyon, Essien won two Ligue 1 championship medals and, after his second season, was named the 2005 Ligue 1 Player of the Year. That success led to a move to Chelsea in the summer of 2005 after an extended negotiation, with the London club paying what was then a club record transfer fee of £26 million. He made 31 league appearances for Chelsea in his first season as the Blues won the 2006 league title. 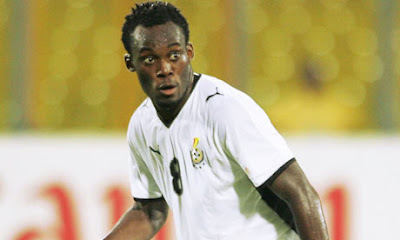 Essien followed that performance by leading Ghana through the group stage of the 2006 World Cup and claiming the 2006 BBC African Footballer of the Year award. He later added another league title with Chelsea (2010), as well as four FA Cups (2007, 2009, 2010, 2012), one League Cup (2007), and the Champions League (2012). Essien currently plays for Panathinaikos after joining them in June 2015.